We’d love your help. Let us know what’s wrong with this preview of Apex Magazine Issue 85 by Jason Sizemore. 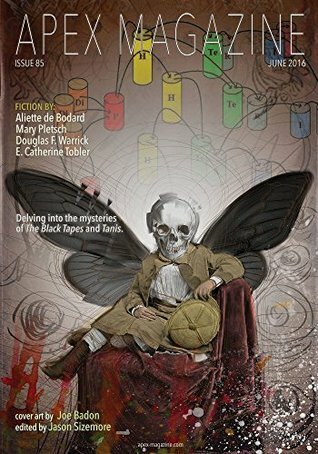 Memorials — Aliette Apex Magazine is a monthly science fiction, fantasy, and horror magazine featuring original, mind-bending short fiction from many of the top pros of the field. New issues are released on the first Tuesday of every month. To ask other readers questions about Apex Magazine Issue 85, please sign up. An excellent issue. I generally don't like horror, but I enjoyed Douglas Warrick's eerie horror villains a lot. I'll read almost anything in de Bodard's Vietnamese future, and this was a different vantages than the ones I'd encountered before. Pletsch's unusual future folklore and an excerpt that make me curious for me, all in all worthwhile. Read Folk Hero (the title initially lead me to expect a ghost story, since I related the word Folk to all things pagans, but it was scifi. It was good though). I also read Cuckoo Girls (enjoyed it). Didn't read Memorials (my scifi quota was already covered) and The Kraken Sea.